My brother is running for reelection in Greenwood County, Kansas. If you are there during voting time, remember to vote early and vote often. Last June, I began this blog. I have posted more regularly than I thought I would. I am wondering if anyone has benefitted from anything posted. Granted, many of these hits are just people who pop on the blog, see it is some religious site, and then get out of there as fast as they can. However, it is still amazing to think that many people have at least hit my little ol' blog. I have put a quiz over on the right side of screen about your favorite type of article that shows up on this blog. Let me know what you think as I prepare for another year of mindless yammering. 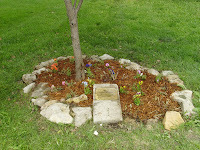 On Thursday, May 29, I drove my mom and my daughter to Lawrence, Kansas to up keep my brother's memorial tree. 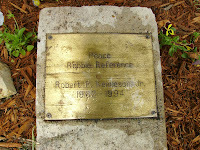 My brother, Rob, passed away May 2, 1994 and instead of being buried in a graveyard, his memorial is a tree at the public library in Lawrence. We went up and clean out the weeds and overgrowth and then planted new flowers. Since he worked in the reference area, they called him "Robbie Reference." 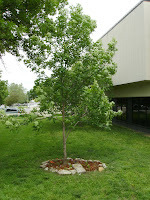 Here is some pictures of Rob's tree. Robert P. Kenneson Jr., 31, of Lawrence died at his home Monday, May 2, 1994. Services were scheduled for 4 p.m. Friday at the Lawrence Public Library. He was born Nov. 2, 1962 in Akron, Ohio to Robert P. Kenneson Sr., and Joan M. Hoch Kenneson of Eureka. He graduated from El Dorado High School, the Automotive & Electrice Institute in 1981, and attended Kansas State University. He worked for a design and landscape company in Kansas city, Kan., Pence Garden Center in Lawrence, and in April 1991 he began working at the Lawrence Public Library as a reference clerk. Survivors include: parents, Joan & Robert Kenneson Sr. of Eureka, grandparents, Mr. and Mrs. Paul Kenneson of Coleville, Pa., brothers, Rory of El Dorado, Rolland of Colorado Springs, Colo., sisters, Angela Hoyt of Cassoday, Audra Kenneson of Eureka. All its going to take is your complete cooperation, absolute secrecy, and twenty live turkeys. Arthur 'Big Guy' Carlson played by Gordon Jump on the Turkeys Away episode of WKRP in Cincinnati. The second Psalm of the Ascents is Psalm 121. Psalm 120 expressed the psalmist dissatisfaction with living where he is at and his longing to go home. It marks the beginning of his journey. Our current psalm, Psalm 121, is about his journey. He has set out and is traveling to Jerusalem. And on his journey, he knows the Lord will keep him safe. I. My Protector is the Creator (vv. 1-2). II. My Protector is Vigilant (vv. 3-4). III. My Protector is Powerful (v. 5). IV. My Protector is __________ (vv. 6-8). This sermon, like the one for Psalm 120, should provide the audience with encouragement that, while they are in the middle of the journey, and things may look dangerous, God is one who watches over them, no matter the time or place. I am struggling with this outline. The most obvious thing above is the phrase for point IV. I want something like "complete" or "comprehensive" but those are not exactly what I am looking for. I am always a sucker for alliteration (it helps me remember as I am preaching and it can really help the audience remember when they walk out the door) so ideally, the last word in each point would begin with the same letter. That is really not necessary, though. I think the title should be stronger - it is a bit elementary. Even the lost will look up to the sky sometimes and say, "someone up there is watching me." Maybe that could be the title? Again, I covet your input. Am I accurately relaying the text as the author intended? Do you have any suggestions on the outline or the general message of the psalm? Let me know. As I said in the previous post, I want to end each of these sermons with a song we sing today which captures the idea of what the psalmist was communicating. I will point out, I will not be singing them (that would just be cruel) but reading them. For this psalm, I chose, His Eye is On the Sparrow (click to listen). Psalm 120 is the first of the fifteen Psalms which are entitled Psalms of Ascents. There is several debates on how these psalms were used. Most hold that they were sung by those who had to travel to Jerusalem for the different festivals which the men had to be present. Some old Jewish teaching indicates that perhaps the Jewish priest sung one of these psalms on each of the fifteen steps leading up to the temple. However, they were used, they were an important part of the Jewish ritual system and religious life. Psalm 120 is a great start to these group of songs because it expresses a dissatisfaction with the place the psalmist is currently living. It marks the beginning of their journey and that journey greatly anticipates the arrival at Jerusalem. The psalmist is longing to go home. It strikes me that this is the feeling of the believer as well. How we long to make the journey, so to speak, to the heavenly Jerusalem (Heb. 12:22)! We are so tired of sin and pain and death that we cannot wait to stand in God's presence. This is akin to what the psalmist is writing about. How to handling living in a sinful world. The whole point of the sermon would be to point out that the psalmist is honest about living in a lost world. It is not a bed of roses. As one commentator put it, "God rescues us from distress but does not preserve us from distress altogether." So the believer should learn some encouraging principles from this sermon regarding the dissatisfaction they experience in this lost world. I think the phrase "deceitful tongues" and "barbaric enemies" could use some work. I am also wondering if the whole construction gives away "the punch line." That is, in the teaching point, I give God as the answer and thus I am wondering if the teaching is over. I also do not like the "how to" in the title. In fact, I am not thrilled with the title at all. I have come to a standstill but I know I am so close. I would sure like some input from several people. What do you think? I am abusing the text terribly? Do I need to change the whole direction of the sermon? If you have some suggestions on different phrasing or anything like that, please post them. I am attempting to finish each on of these psalms of ascents with a song or hymn from our time that captures the same sentiment. I think a song that captures what the author of Psalm 120 is attempting to communicate is old Gospel song, Sweet Beulah Land (click to listen). I have been attempting to develop two sermon series for several weeks now. The first is a series through the book of Haggai. I have been enjoying the study and hope to post some thoughts about it in the next few days. I have also been attempting to develop sermons from the psalms of ascension (Psalms 120-134). I recently taught through Psalm 119 and thought I should continue through Psalms. I realize it is not the same as preaching through Ephesians, or Genesis, or even Haggai. Hebrew poetry is a challenge, which I why I want to work through it. As I have been working through these, I have really just cramped up in the brain. I just cannot think through some of these things. I have been praying through the study, I have just sat and read through the passages, and I have come to a standstill, so to speak. So I try to go on to other things and let my mind engage in other activities and then come back to these passages later and still nothing. Let me be clear, I am obviously finding all kinds of valuable material and great application for sermons. It is, after all, the Word of God and is always alive and profitable. The problem I am having is attempting to find the teachable points needed in a sermon. Granted, I have a somewhat traditional model of preaching and some have issues with that. But my goal, as always, is to faithfully relay the text to the audience with relevant principles for today. So as I was struggling with these things, my wife told me to post some of my thoughts and have others let me know what they think. So, I will be posting some of my thoughts, outlines, and other things on these passages and I any help you all could give me would be greatly appreciated. Also, if these are useful to you please use them and share them as needed. If you do that, let me know how you used them - just because I am curious. I think I will begin with the Psalms. However, I will start with the next post. This post is already long and I do not want to combine topics (it is easier to sort when it is only one topic per post, so to speak). So I hope the following posts will help you and I hope you responses will help me. I have not blogged here for a while but I have been blogging. I started a new blog recording my new hobby. You will have to read it to find out what I have been up to...not that you do not have any thing better to do. Click Here to read my other blog: A Turn of Events. Or you can click the link to the right. I will get back to these things but I am having fun playing right now.